Blame it on being an East Coast girl, but California has always possessed a certain mythic quality to me. The soaring redwood trees, the rocky cliffs, the glitzy Hollywood, and the scorching deserts seem to belong in the pages of an adventure novel rather than a real place. 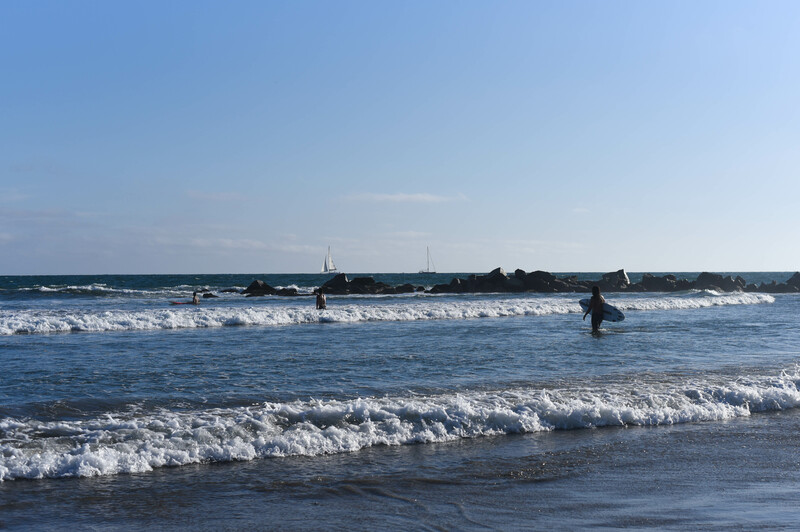 I spent two weeks in southern California at the age of 11 and still remember the wonder I felt at seeing the Pacific Ocean for the first time. The other memories from that trip — of the San Bernardino Mountains, the La Brea Tar Pits, the Del Mar Racetrack (I was really into Seabiscuit), the Grauman’s Chinese Theatre — still stand out brightly as treasured moments of awe from my childhood. My chance to visit California again came last summer when a work trip stuck me at LAX for a nine-hour layover on my way back to DC. When I first reviewed the flight itinerary, I was less than thrilled. Spending all day in an airport was the last thing I wanted to do after flying ten hours across the Pacific Ocean. But then it dawned on me — this was the perfect opportunity for me to spend the afternoon in LA. I had just enough time to soak up the sun for a few hours and then return in time for my flight later that evening. I had never left the airport for a layover before. It almost felt dangerous, like I was breaking a secret travel rule. I was excited by the opportunity to explore, but I was also nervous about the risk I was introducing into the trip. The time I had to dead-sprint to make a train in Spain had traumatized me into always showing up at least two hours early for transportation-related events. A week before the trip, I scouted a nearby locker rental place that I could drop my luggage off at and narrowed the scope of my adventure. I only really had time to visit one place, so I decided to visit the iconic Santa Monica Pier area that I had seen in so many movies and television shows. I was ready for my day out in LA. The day of my layover, I arrived at the airport jet-lagged and severely sleep-deprived but determined to run on pure adrenaline for the rest of the afternoon. I shed my gross plane clothes, changed into an LA-friendly outfit (tropical-print top, of course), and hopped in an Uber to the locker rental place. I stuffed my carry-on bag in a locker, paid $16, and didn’t have to think about it again for a few hours. The rest of the afternoon passed by like a vivid dream. I think the fact that I effectively hadn’t slept in 30 hours (I can’t sleep on planes) put me into what I can only describe as a lo-fi state of mind. An indie surf rock soundtrack played in my head as I walked onto the Santa Monica Pier and joined the crowd of tourists and street performers. The rainbow colors of Pacific Park stood out brightly against the cloudless blue sky. Jingles from the arcade games, the whoosh of the roller coaster, the quiet whistle of the wind across the ocean, and the shrieks of happy children wove together in a melody of summer. After walking around the Pier for a while, I rented one of the motorized Bird scooters that littered the paved sidewalk and zoomed past the bikers and rollerbladers all the way to Venice Beach. Venice Beach has a totally different vibe than Santa Monica. 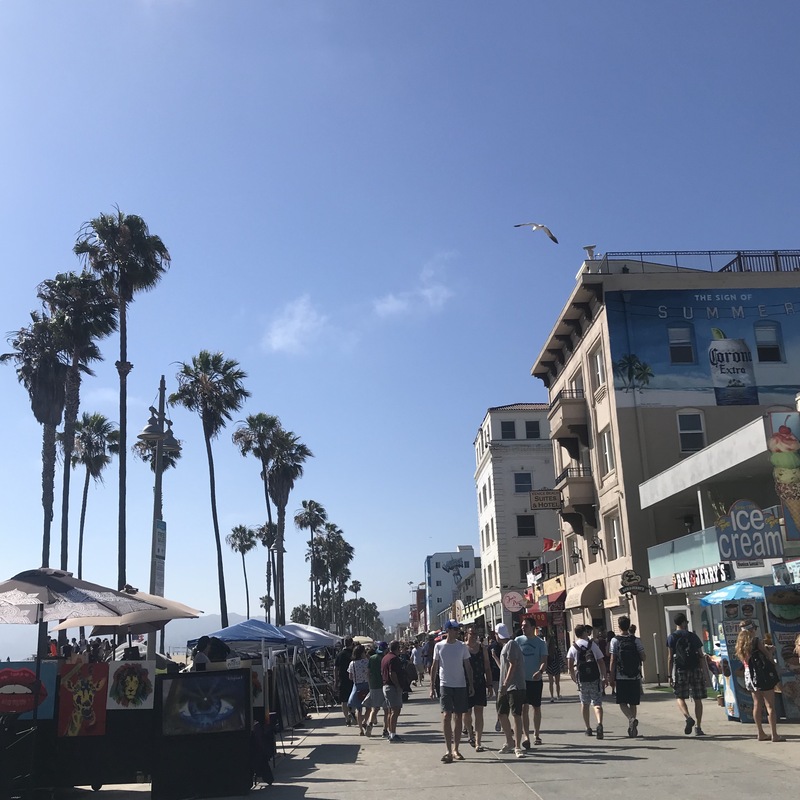 Venice is almost frenetic with its sidewalk bars, artists stands, skateboarders, and surfers hauling their boards down the boardwalk palm tree-lined boardwalk. I was in love. 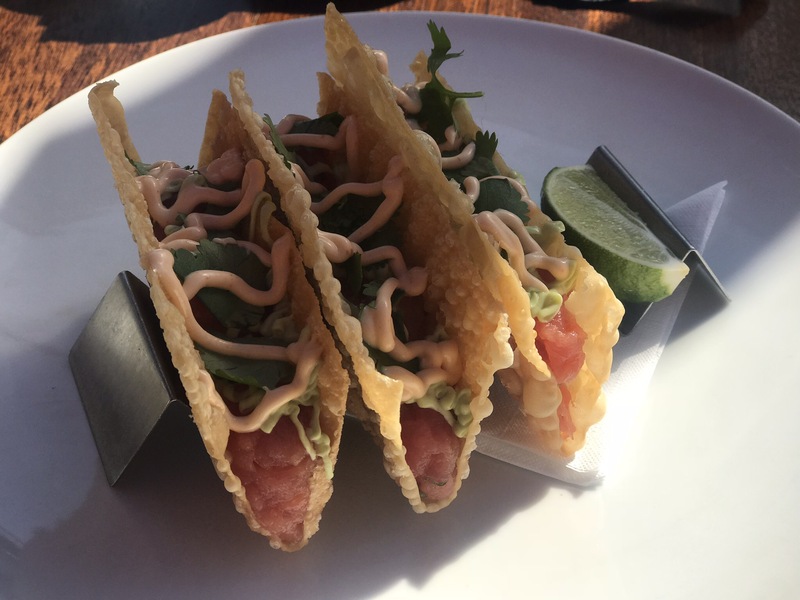 I stopped for some ahi tuna tacos and a beer at Larry’s and soaked up the sunshine for the last few hours before I headed back to the airport. It was the perfect way to spend a layover. California, see you soon!